We are very interested in your opinion about “Agioklima Traditional House” and your experience with us. I spent 18 months in one of the AgioKlima Houses, which probably were the sweetest years of my life. Waking up between these beautiful stone walls, having breakfeast in this peaceful little garden dominating the olive and wine fields running down to the everblue sea, with the majestic silhouette of Psiloritis in the background. The greatest palce to watch the seasons go by, sipping a good frappé. The village itself, as authentic and quiet as can be. Heraklion just 20 minutes away. My only regret is I could not spend all my life there. We want to come again! Agioklima is wonderful. My husband and I were there in Sep. 2012, and for us it was the perfect vacation site. The location in Crete is central, so shopping and sight-seeing in Heraklion, dining in Chania, checking out the wineries throughout the island, and playing on the southern beaches are possible day trips by car. The village of Petrokefalo is small enough to have no traffic or noise problems, but sophisticated enough to have an exceptional restaurant (reasonable prices too). The accommodation is charming, comfortable, private, and well equipped. And the view is spectacular! Niki has thought of everything, and goes out of her way to make sure guests are thoroughly enjoying their time there. You walk out of the house to stroll down a path among grape vines, and the fig and olive trees, and nobody minds if you taste one of each. Our stay there was heavenly. If you want beauty, calm, and real, delicious Greek home cooking, Agioklima is a great choice. 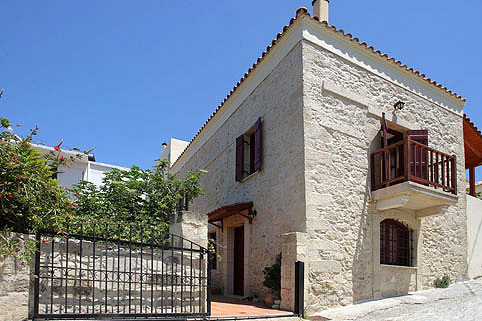 Agioklima is a beautifully restored house in Petrokefalo, a traditional village about 15km beneath Heraklion. 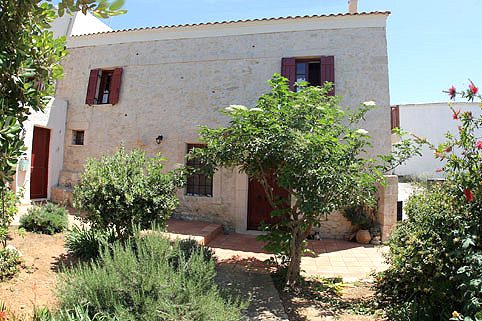 The spacious house is situated on the outskirts of the village. 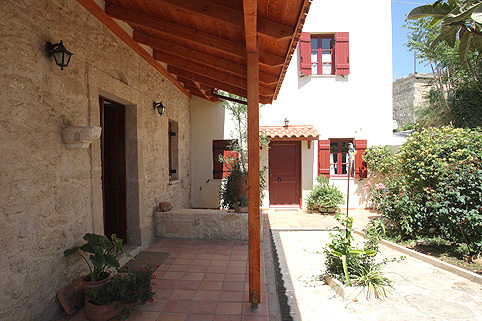 It is well-equipped, and has a lovely garden with seating area and mountain views. Niki welcomes you and will give you recommendations for trips. 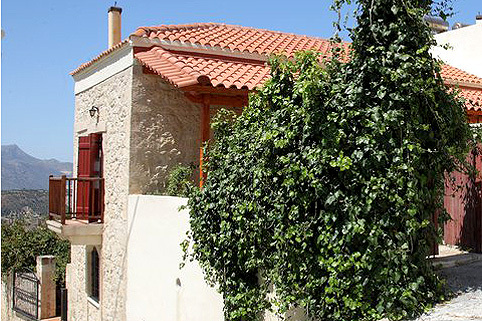 The village has a small kafenion: no better place to discover dishes of the Cretan cuisine. 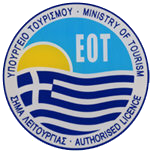 In nearby Agios Mironas is a very good restaurant with local food and great service . Agioklima is a must for those looking for the real Crete! Agioklima was the perfect place for our getaway! The room was spacious, the view from the terrace was inspiring and the kitchen was well-equipped for cooking and coffee (we mostly prepared breakfast). The location is perfect, away from the city atmosphere of Heraklion but still close enough to visit and the place was serene and offered the greatest early morning and dusk views. We rented a car and were able to visit the neighbouring villages and the wider area further to the south. The host, Niki, gave us a warm welcome and answered all our questions in the most helpful ways! We are always looking for ways to go back, unfortunately it hasn't happened yet. Me, my husband and our half-year old son spent two wonderful weeks in Agioklima. The house was an old traditional house, but very comfy.. The view from our terrace was breathtaking: vineyards, mountains and the sea. The village is small and peacefull, and off the beaten track, which was great, but at the same time it's close to get to in a car from Heraklio. Niki, the host, is friendly, generous and helpful. Mostly thanks to this place and our host the holiday was unforgettable and one of a kind. Thank you again Niki!